Below is a list of the best baits for night time swordfishing. Including the pros and cons of each bait. Dead squid is the bait of choice when it comes to catching night time swords. If you cut open the belly of almost any swordfish, you are bound to find its stomache filled to the brim with squid. Most swordfishermen prefer using dead squid (between 9 and 14 inches in length). In some areas (like the northeast United States) you can catch you own squid consistently. Although in Florida, most of the East Coast States, and Gulf Coast states, you will be better off buying your squid in a bait and tackle store or directly from a bait source online such as Baitmasters. 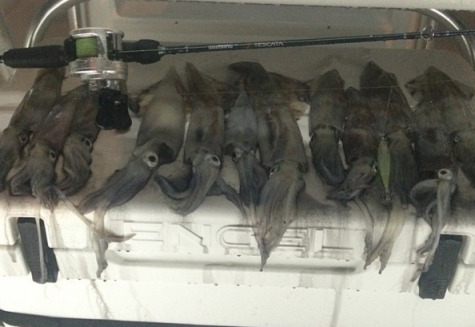 Photo of squid caught by #BullbusterAmbassador The Tree Guy. 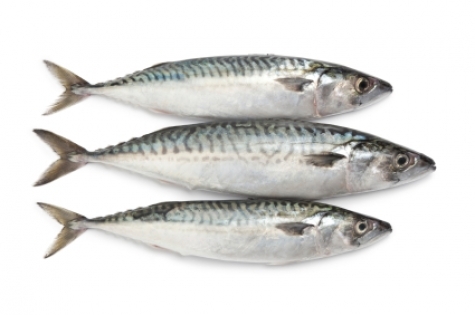 Tinker mackerel make an excellent bait for swordfish because they are often found out on the sword grounds. 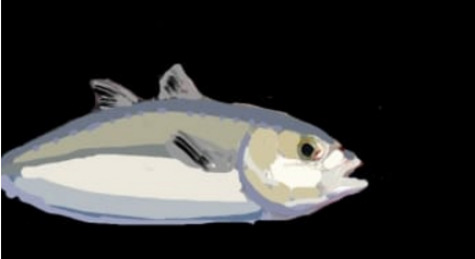 Tinker mackerel can be fish both dead and alive and is considered swordfish candy. Blue runners are one of the most productive baits for night time swordfishing, they are also easy to catch near the dock in most areas. Having a few live baits in your night time swordfish spread is bound to increase your chances of hooking up. * Beware using live bait for swordfish at night may lead to foul hooking your fish (It will be totally worth-it though). Bullet size bonita can make excellent night time swordfish baits and can be caught by trolling small lures on your way out to the swordfish grounds. *Bonita need to constantly swim, so they may be hard to keep alive in a traditional live well. It hasn't become too mainstream to see people using artificial squid for swordfish at night, which is surprising, because there are so many advantages. 1) Artificial Squid are re-usable (they also don't get slashed open, or washed out, like natural squid). 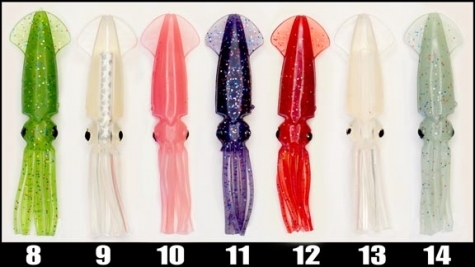 Use a plastic squid like these from Mold Craft. 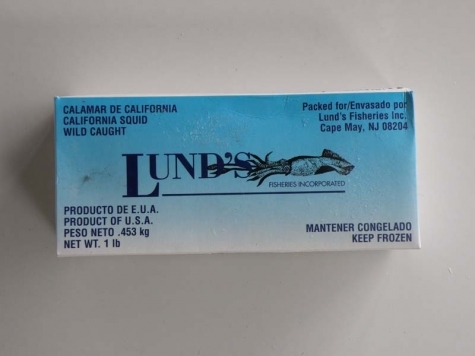 Instead of buying a 14 inch squid for $10.00 you can buy a box of calamari for multiple trips at only $3.00 and stuff your artificial squid with it, getting the best of both worlds as far as appearance and smell goes. 3) You can stick a flashing light inside your artificial squid, with a lot less fear of loosing it. This will make the squid look like it would naturally. Check out this video posted on youtube by "Nicolator" of a squid underwater and changing colors like it would with a flasher inside of it. 4) With artificial squid you can do crazy things like make an entire school of them. If you are interested in swordfishing take our swordfishing category page, this page has all things swordfish, including tips, techniques, and reports. If you have want to make a commitment to spending more time fishing become a member of bullbuster.net. Save time and money by using Bullbuster Brand Direct Fishing Lines and spend more time swordfishing.